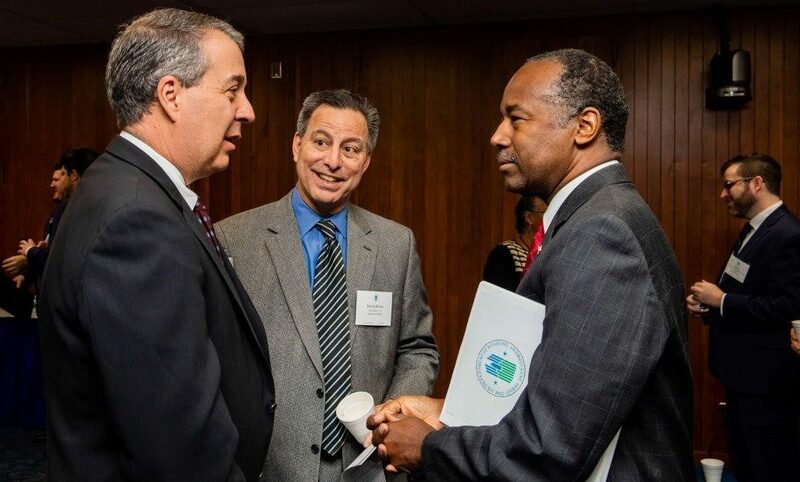 Longtime NRMLA board member and Executive Committee Chairman Joe DeMarkey of Reverse Mortgage Funding LLC attended a recent “Stakeholder HUDdle” with senior officials from the Department of Housing and Urban Development where he had the opportunity to meet Housing Secretary Dr. Ben Carson and thank him for his support of the HECM program. Speaking on NRMLA’s behalf, DeMarkey emphasized HECM’s importance in helping older adult homeowners live a financially comfortable retirement; expressed the industry’s relief that FHA Commissioner Brian Montgomery was confirmed in June after an elongated process; supported the two recent mortgagee letters that helped strengthen the Mutual Mortgage Insurance fund and was a good outcome for the industry; and offered to work with the Department on other recommendations that the association has made (mostly on the back-end), which will further improve the financial health of the MMI fund. “Secretary Carson is an engaged, thoughtful leader who appreciated our comments on the steps that FHA is taking to ensure that HECM remains a viable retirement planning tool for future generations of America retirees,” DeMarkey told Weekly Report. DeMarkey was joined by David Horne, one of NRMLA’s outside consultants who also served as HUD’s chief of staff during President George W. Bush’s second term. From left to right, Joe DeMarkey, David Horne, Housing Secretary Dr. Ben Carson.